The ASEAN Business Club in collaboration with Keizai Doyukai (Japan Association of Corporate Executives) held a bilateral dialogue session on 25 March 2019 at The Industry Club of Japan, Tokyo. ABC was represented by Tan Sri Munir Majid, President of ABC and Hong Ju Khee, Executive Director of ABC. Keizai Doyukai was represented by Mr. Keisuke Yokoo, Deputy Chairman of Keizai Doyukai. Keisuke Yokoo mentioned that Keizai Doyukai, with a membership of about 1500, has been actively engaging with overseas leaders, in particular with ASEAN since the 1970s. The association conducts annual dialogues with business leaders overseas, in particular, it holds the ASEAN Japan business meetings annually. “Due to the development in ASEAN, Japan’s relationship with ASEAN is changing and it is important for Japan to evaluate what is the best relationship between Japan and ASEAN and we are honoured that the Malaysian Prime Minister Tun Mahathir revived the Look East Policy,” said Mr. Yukoo. ASEAN Business Club: Courtesy Call to Naotoshi Okada, President and CEO, Nikkei Inc. 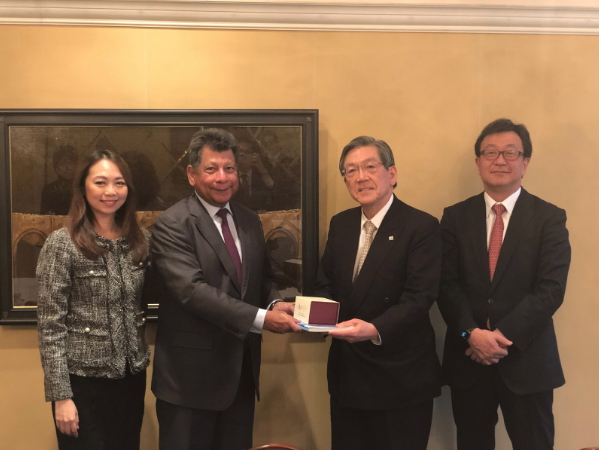 The ASEAN Business Club, represented by Tan Sri Munir Majid, President of ABC and Hong Ju Khee, Executive Director of ABC, also paid a Courtesy Call to Mr Naotoshi Okada, President and CEO of Nikkei Inc on 25 March 2019 at Nikkei Inc’s Head Office, Tokyo. Nikkei was ABC’s Media Partner in 2017.